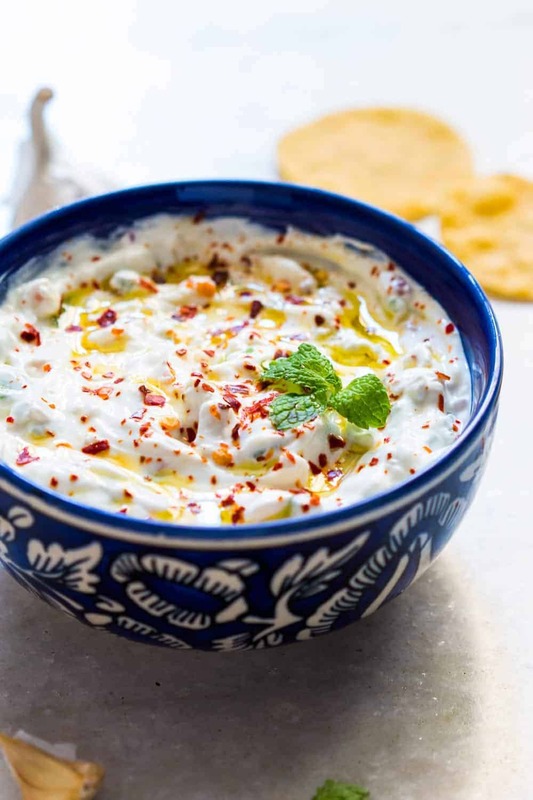 This garlicky yogurt party dip is the kinds that won’t make you feel guilty if you binge on it, A light, refreshing and super addictive dip that goes well with veggies, chips, wings, cutlets, fries and other finger food. Low calorie and healthy too. I have big plans with my little sister this weekend. She’s hosting a farewell party – for her house. Yes, you read it right the first time. The party has been hosted in honor of this place that she’s been calling home for almost 5 years now. Call us nuts, but it deserves a farewell. It’s been that place everyone crashes at after the party, that place where friends of friends bunk on the couch, where evenings are spent giggling over old stories and friends are made for life. Homes have as much a part to play in our memories as people do and I’m sure all of us have that favorite room, a favorite desk by the window, that coffee shop where we sat for hours doing nothing with friends. This was ours. When we moved in (I used to live with Pragya till a few years ago) it was just bare walls and then we started adding our own little touches – a poster here, a wind chime somewhere, cushions strewn about, curtains which would sway to let the light stream in, pictures on the wall and then one day we realised that it became home. Even after I left, I always had a room to stay whenever I visited but moving on is part of growing up, right? While we are all sad, we want to end it in style and hence the big farewell and all! I’m the official party food planner and I’m not going to go into the details but there are brownies, meatballs and wings involved. Nothing makes a party going like some hot, dirty wings smothered in tangy sauce that has to be licked off your fingers but more of that later! Today I have some party food for you (yes, that’s where all this was going) which is a hit! While I may like to spend hours slogging away in the kitchen, I know you don’t. So let’s help you put together something real quick to get the party started! 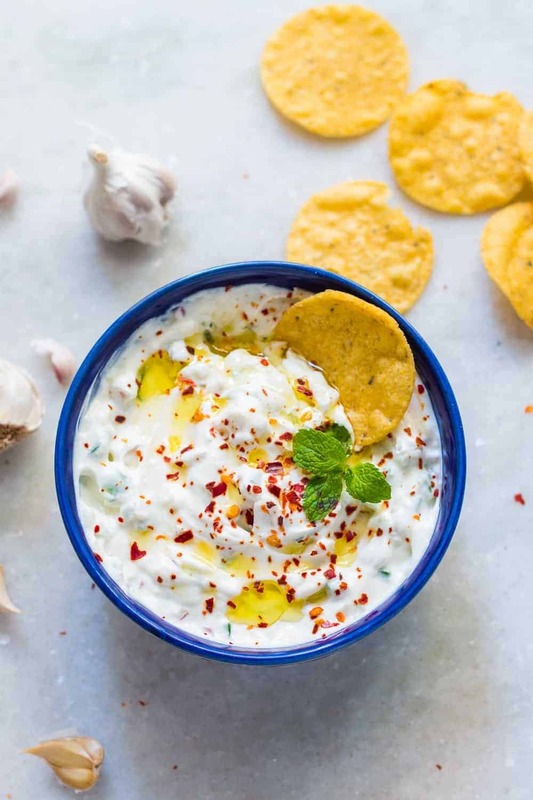 I’m sharing the recipe for my Garlicky Yogurt Party Dip which is super addictive and vanishes pretty quickly. So you may want to make an extra bowl. If you try this out, I’d love to know what you thought about it. Connect with me on Facebook and Twitter. 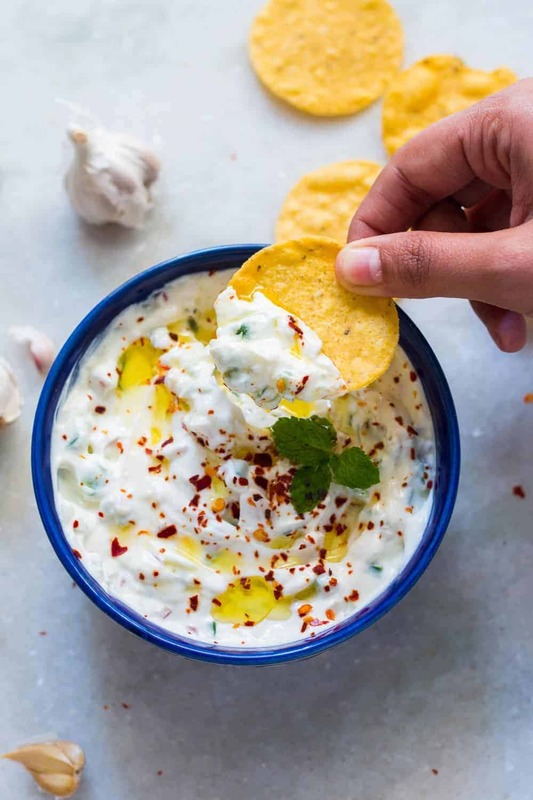 A light, refreshing and super addictive garlicky yogurt party dip to go with chips, wings, cutlets, fries and other finger food. Low calorie and healthy too. Spoon yogurt into a sieve (don’t worry it won’t drip through) and place the sieve on top of a vessel for an hour in the refrigerator. All the whey will drip down in the vessel, leaving thick curds. Whisk in the garlic, add capsicum, onions, spring onions, salt and mix. Leave this in the refrigerator for half an hour or more. Sprinkle with chili flakes, and drizzle with olive oil just before serving. 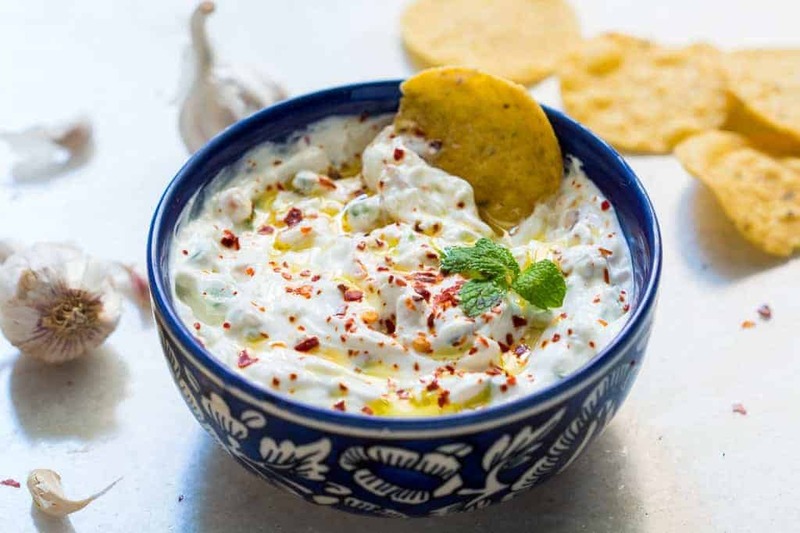 Add an assortment of carrots, cucumbers, broccoli, breads and chips to the plate alongside the dip. I’m a new comer to the Indian Obessed Cuisine. 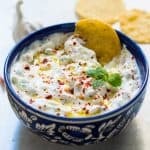 I’m hosting a First Footing for the New Year & adding to my Indian spread I found your site, on this recipe can you recommend a yogurt brand you tend to favor? I think this along with your samosas, and a few of your curries will be the right touch. Thanks Jennifer, this one’s always a hit! Love me a great dip! I love that you added some chili flakes to the creamy yogurt! On my dip list for sure! Thanks Hina, glad you liked it! Amazing recipe and amazing shots!!! Thanks Zeeshan, I hope you like it! Thanks Vaidehi. You made my day!